Clients know us as GHF or Gray Horse Farm. GHF has been in the Hamptons for 6 years. Both of us come from big time riding families and developed a passion for horses as children, and then turned our love of horses and riding into a career. For us it’s quality not quantity. We try to offer a premier service to our clients and our horses. We are so lucky that we have amazing horses and ponies to work with. We just try to have the best of everything, equipment, staff, organization, and of course, horses and ponies! We have a such a diverse group of clients that we try to build long-term relationships with. We cater to all ages and levels. For instance, we have little kids, ages 3 and 4, that compete in leadline, and we also have some clients competing all the way up to the Grand Prix level. Another element that sets us apart is that we embrace and welcome students that aren’t looking to compete, they just want to better their riding skills and spend some time with these amazing animals. One thing that we are very good at is tapping into the need of each individual rider. Whether the student is timid and nervous, or brave and confident, we try to bring out the best in each rider. Many parents over the years have said that riding was the best thing they could have done for their child. Self-discipline, compassion, and confidence are a few of the traits that we, as trainers, try bring out in our students. I love matching the perfect horse with the perfect rider, and watching the pair grow and succeed. It’s magical when you see a horse and rider connect. Sometimes we even feel like the horses pick their riders, which is really special. Also, we have had many of the horses in our barn for years, and it’s just amazing to walk into work every day to a barn full of our best friends. We don’t like to share our secrets! Besides the fitness benefits?! Riding is one of those things that really works out the whole body without you even realizing it! A lot of our moms rode as kids, so this is a great way to reconnect with a childhood passion. For some families, it’s so special for mothers and children to bond over their shared love of horses. Both of us coming from riding families. 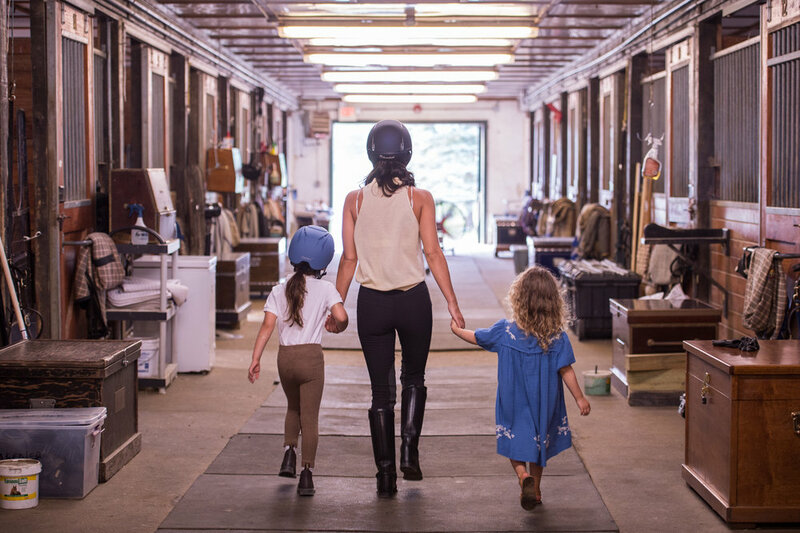 Some of our fondest childhood memories are spending time together at the barn or waiting for our class at the horse show. For other moms, we are a here for a little ME time! Our hours make it easy to drop the kids off at camp (we offer camp!) and have some alone time! On numerous occasions our clients have said that after spending time in our program they have never felt so confident and comfortable in the saddle. Erin’s Dad of course! Don Stewart at Don Stewart Stables runs one of the top programs in the country and we are so lucky to be able to collaborate with him. He is such an inspiration to us, he’s always there with wisdom, advice, and encouragement. Having a great team! There is nothing more valuable in our business than having employees that have the same values and standards as we do. This business is full of surprises but we do our best to be as organized as possible and assign each staff member responsibilities.